appearance: multi coloured spikey hair, black jeans,black top, blue eyes. history: toshiro was a really smart boy at an early age, really liked computers and was able to take them apart and put the back together in the space of a hour. at age 16 he went to collage to do electronics and bulid his frist computer from scratch. after a while he heared about AT's and to him they sounded like a bit of a challenge, he found them to be a pretty gd bit of kit and so now since toshiro has been riding AT's he has been workin on the road as a computer tec hopin that he will find a job that meet his standerds. 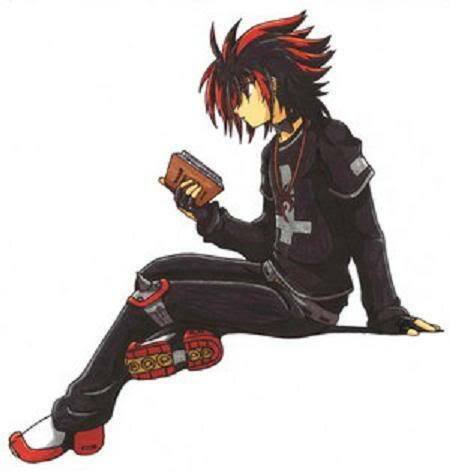 personality: toshiro is a very easy goin guy and when he is workin he gets deep in thought and does not like to be disturbed. he also has a very short temper so gettin on his back is not a good thing. he also likes to get to know new people and doesnt judge people when he first sees them. likes: like his line of work, likes to get drunk after a hard days work and like to play games. dislikes: doesnt like bein told how to do his job, people who think they know it all and eatin to much fatty food. Okay Toshiro, I've reviewed your application and I find the changes quite agreeable. The new pic is more appropriate somehow, and it's nice to see that you've decided on a road. You can now start to RP. Try visiting some of the areas around, perhaps the school or the hospital. remember not to spam post buddy trg to write a sentence not one word lol. Toshiro, if you have a problem with the site administrators editing the spelling of your posts, maybe you should re-read the Forum Terms of Service. - please make an effort on grammar and spelling. SMS-style language (ex: r u sk8ing?) is not advised. I'm sure that Hironozuka did not mean to cause offence by editing the spelling of your post, nor would he ever go out of his way to upset another user of any forum, let alone a forum where he has Administrator privileges. However, if you do not use correct grammar or spelling, you should not be surprised if somebody edits your posts.